Tahoe Paddle & Oar is a full service paddlesports shop with everything for the novice to the experienced paddler. Located in Kings Beach on Tahoe’s North Shore, we offer the easiest access to the water in our area. We offer top-end kayak and paddleboard rentals along with guided tours and a full paddlesport retail store with everything you need to get you paddling. 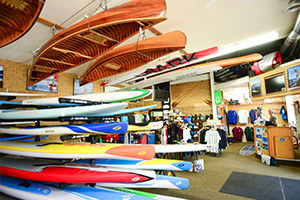 Tahoe Paddle & Oar offers a full line of paddleboards, kayaks and canoes including Surftech, Bark, Bic Sport, Ocean Kayak, Old Town and American Traders. Come and discover one of the more serene ways to enjoy Lake Tahoe by gliding through the cool, clear water where you can find hidden beaches, rocky coves and gigantic boulder mazes. 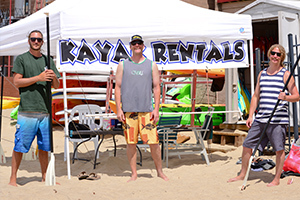 Tahoe Paddle and Oar provides Ocean Kayak sit-on top kayaks and Surf Tech and Bic Sport Paddleboards for rentals. All of our rental equipment is very stable, user-friendly and no experience is necessary. Our retail store is located at 8299 North Lake Blvd. in Kings Beach – we offer a full line of paddleboards and kayaks including Surftech, Bark, Bic Sport, Ocean Kayak, Old Town and American Traders. Our friendly and experienced staff will guide you through gigantic boulder mazes and will also provide you with instruction, talk about the history of the lake and the geological history of the area. 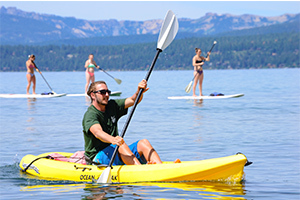 Tahoe Paddle & Oar is dedicated to creating recreation opportunities for guests to explore Lake Tahoe, create memories, and have fun with friends & family. At Tahoe Paddle & Oar, we recognize the environmental, personal health and spiritual benefits of paddling the crystal clear waters of Lake Tahoe. Established in 1986, we strive to provide our Tahoe Basin guests and residents with the best access to paddle sport opportunities while leaving no trace. We invite you to experience the North Shore of Lake Tahoe aboard a kayak or stand up paddleboard - a fun adventure you'll never forget.